We are engaged in manufacturing a range of Board Cutting Machines for our clients. The Board Cutter Machine is hand-operated machine used for cutting the paper or corrugated board. The machine is heavy duty made from fabricated Iron Frame and heavy duty Cutting knife for easy operation and durability. This is a hand operated Board cutter to cut the paper or corrugated board in the form of sheets. 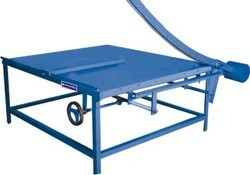 This board cutter is heavy duty in casted frame, front and back guides are provided with the machine for exact cutting. The balanced cutting knife enable free cutting with minimum pressure and the blade are high precision hardened ground balanced cutting knife enable free cutting with minimum pressure. Speed 3600 Stroke / Hrs. Max. Speed :- 3600 Stroke / Hrs. Max. 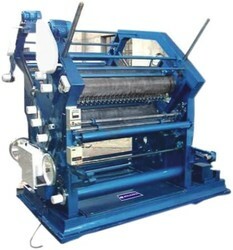 We are one of the leading manufacturer and exporters of a wide range of double profile high speed single face corrugation machines which are designed with heavy duty bearings mounted with two sets of flute rolls which of time, rolls Dia 9.1/8" roller material forged En-42, pressure roller graded casting duly hardened, stainless steel heater with heat sensors and digital counters, electric motor Siemens /ABB make. A C drive Siemens /ABB make. 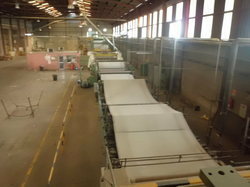 Preheated for linear paper & Precondition for fluted media paper, drive roller from gear box & Hydraulic real stand. 52" 36 KW 5.0 30 6.0 120"x175"